Using a “split pen method”, Smellin’ Good spray, and having young gerbils to work with, I successfully introduced my breeders today! They are currently sleeping all snuggled together with their new mates in their appropriate tanks. The Doctor & River checkin’ each other out. Amy watching Rory from a distance before going to greet him. So excited to meet the babies someday. Currently they are a bit young to be interested in mating, but soon that should change. At the pet store where I work, we strive to take top notch care of the animals we have in our store. We treat any sick or potentially injured animals and are very proactive about their health. However, sometimes shortcuts must be taken. Our animal provider generally sends odd numbers of gerbils. Three, five, seven, nine. No matter my efforts to sell them in pairs, there is always one sad gerbil left alone. 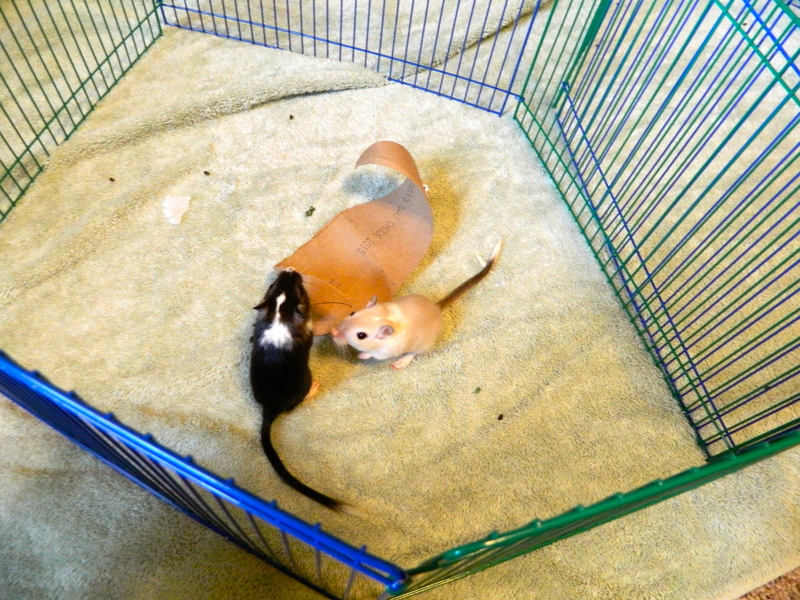 When the next shipment of nine or so gerbils arrives, it is in the lone gerbils best interest to be reintegrated into the group. A huge no-no in most gerbil forums and websites. But I am here to tell you that not only is it possible, but it can take as little time as five minutes, requires no cage divider, and has a 95% success rate. The reason gerbils attack one another is because they smell different. They don’t smell like one of their own “clan”. (Unless they are kept in restricted quarters and begin fighting for space.) The trick to introducing them peacefully is to mask their personal scent. 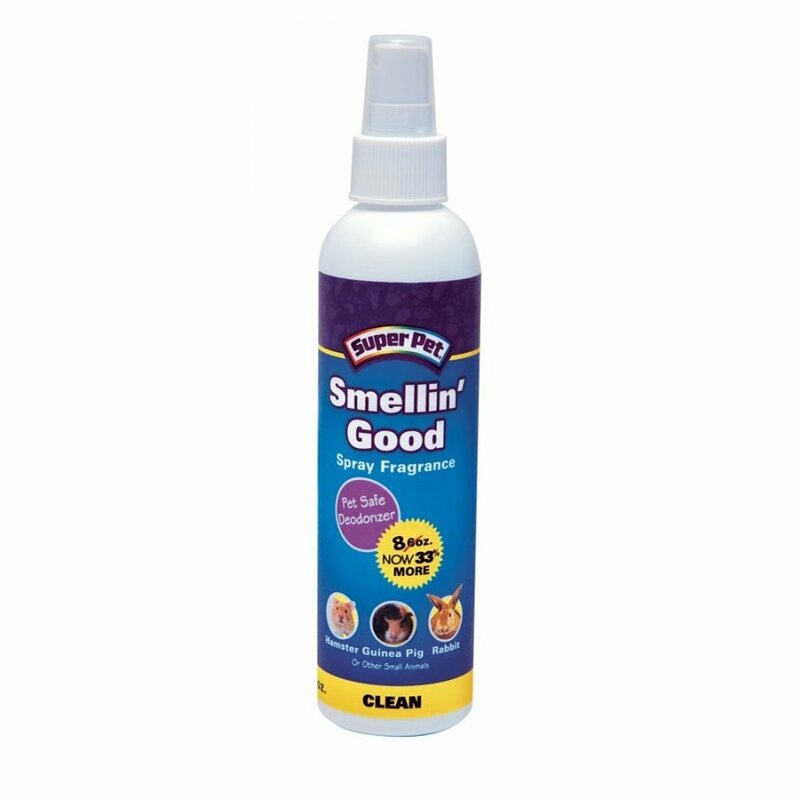 Smellin’ Good is a pet safe deodorizer sold at our store. One small spritz on the rear end of all gerbils involved in the introduction and–at least with young male gerbils–they welcome one another with open paws! By the time they’ve rid themselves of the baby powder scented spray, they’ve been with each other for over an hour and are all sharing one smell. A newly formed clan! I have literally introduced three groups of three with this method and come back to find all nine sleeping together in one hide house. I cannot guarantee this method always works, just that so far it has always worked for me in a pet store environment. Tomorrow I am going to attempt it with mine, with much caution. I will post an update later. A lone gerbil is a sad gerbil! Unlike the solitary Syrian hamster, gerbils live in fairly large social groups when found in the wild. 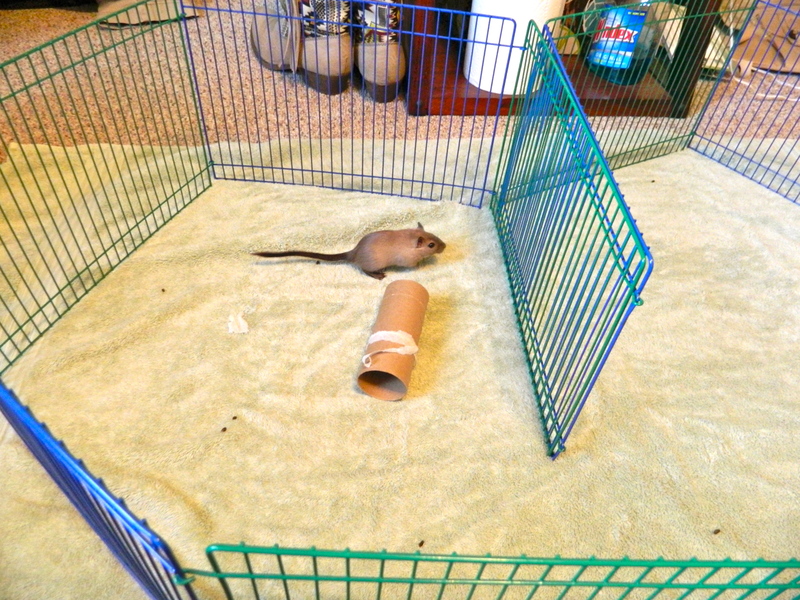 This makes gerbils ideal pets, as they are naturally more outgoing, trusting and often bond to their human companions! 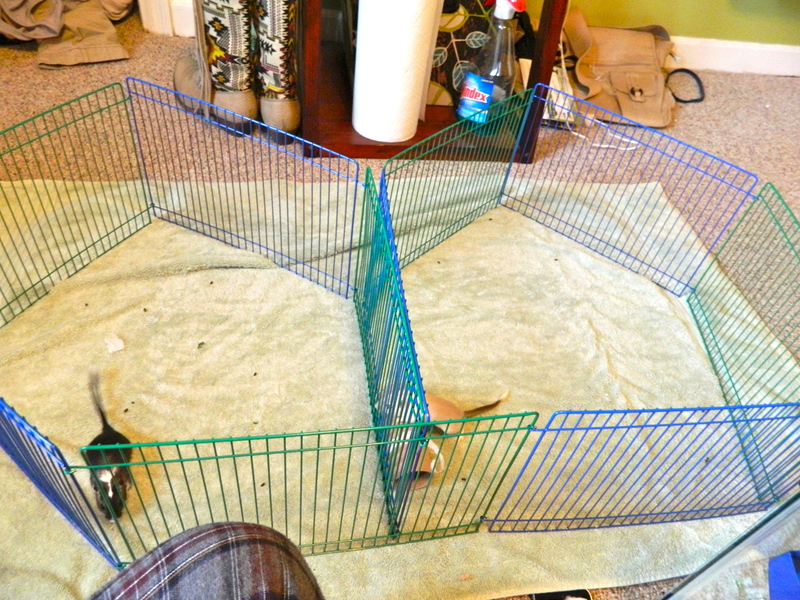 The Myth: If I get two gerbils, they will bond to each other and not me! The Truth: Not so! Gerbils require the security and companionship of another of their species! When kept alone, gerbils often become lonely, depressed, paranoid and more prone to biting and bolting. A lone gerbil will be more likely to be overweight, it’s lifespan will decrease, and it may develop obsessive behaviors such as bar biting. 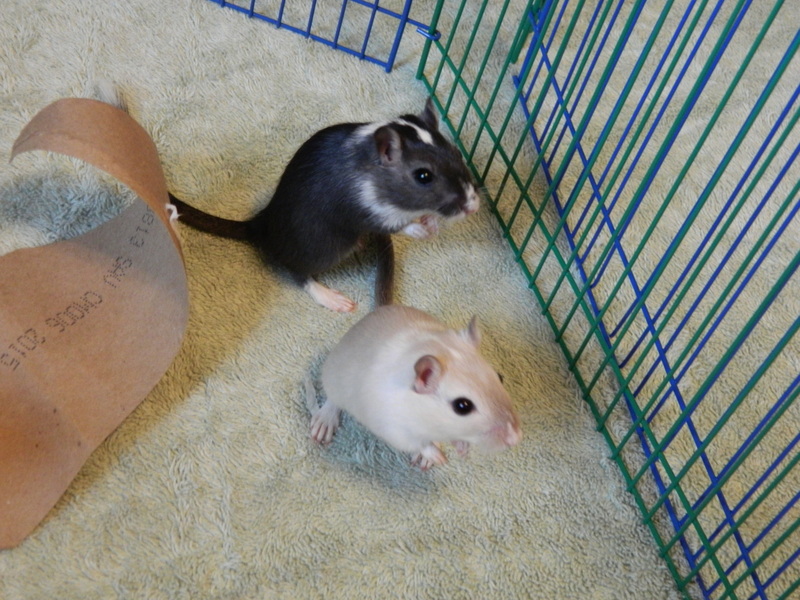 Gerbils need to be housed in same gender pairs in order to live a long, happy, healthy life! They enjoy grooming and sleeping with each other, playing together, and even running on the same wheel together! They will also be more active and enjoyable to watch when kept in pairs, as well as easier to tame. Female gerbils tend to be a bit more temperamental than males, and may fight as they become older. If it is a companion pet you seek, I suggest a pair of males, preferably purchased at the same time from the same cage. If you have unknowingly purchased a lone gerbil and are seeking a companion for it, first identify it’s gender, and then seek out a reliable source for it’s same gender companion! Once acquired, use the split cage method to introduce them. Gerbils are usually open to accepting new friends, especially when already alone, but don’t get in a hurry! Gerbil fights can be bloody and violent! Be sure your gerbils are displaying friendly behavior (such as sleeping next to one another on opposite sides of the divider) with one another for an extended period before leaving them alone together.